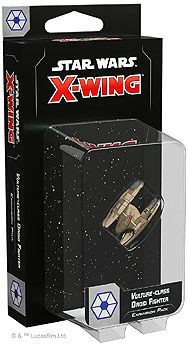 Expand and upgrade your Star Wars: X-Wing game! The Vulture-class Droid Fighter is the backbone of the Separatist Navy and emblematic of its strategy: weak in isolation, but overwhelming. A sufficiently vast swarm of networked attackers form a cunning, sinister intelligence that can defeat even wise and powerful Jedi pilots. This pack includes everything you need to add 1 Vulture-class Droid Fighter ship to your game.